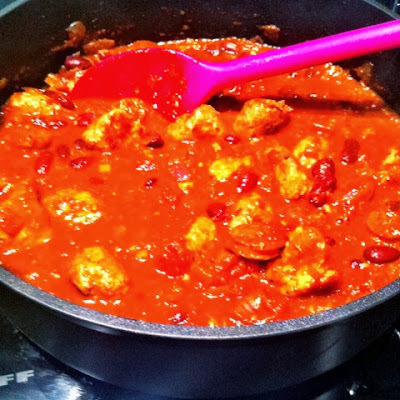 52 Cookbooks #9: Chilli con sausage! I know it's not the usual combination. The recipe is actually titled sausage con carne in the book, but as carne is meat and the meat is sausage I think chilli con sausage is more apt. 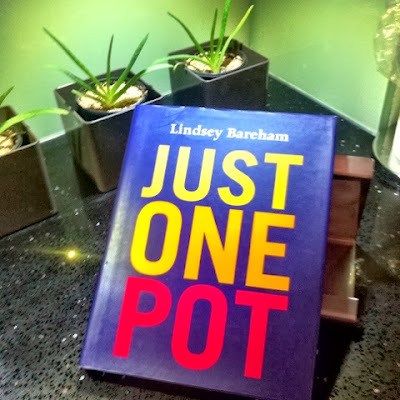 The cookbook I've used this week is Just One Pot by Lindsey Bareham. 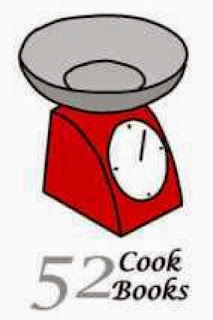 Lindsey used to (and may still have) a daily column in the Evening Standard each with a recipe that commuters could use for dinner that night. That must be quite a challenge to keep going over many years! And I must say we've got a couple of the recipes cut out of the paper that we use occasionally. This is a great book and most of the recipes are one pot affairs. They're also recipes that are easy to cook after a day at work. This was ideal for me as despite not working at the moment, originally I planned to cook this Friday night, after having gone out for lunch which I knew was likely to be a longish one. It was delayed for a day though as MOH texted to say he was feeling unwell and wouldn't want any tea. He's better (but there is still a lingering cough) and we had this for dinner last night. The surprise ingredients - apart from sausage - is chorizo and ground cumin. There's also oregano and the more usual tomatoes, chilli powder and kidney beans. The surprise ingredients do, I think bring a certain smokiness to the end dish. MOH was sceptical about the whole thing, but his plate was clean and he'd eat it again! High praise indeed. Incase you're wondering how I got around the obligatory green stuff, all I'm saying is guacamole! It's also an economical dinner, I used four sausages and it would easily serve three, perhaps four at a push.